The most recent damning report on BPA from the Center for Environmental Health documented the current use of BPA in can linings and found that 38% of the cans tested from four large national retail chains — Kroger, Albertsons, Dollar Tree, and 99 Cents Only — still use BPA-containing linings. They also found that, in many can linings, and different toxic materials may be used in place of BPA. For example, 19% of cans tested use linings containing PVC, which is considered a toxic substitute. According to the Environmental Working Group, “BPA is a synthetic estrogen that can disrupt the endocrine system, even in small amounts. It has been linked to a wide variety of ills, including infertility, breast and reproductive system cancer, obesity, diabetes, early puberty, behavioral changes in children and resistance to chemotherapy treatments.” There is seepage of BPA into food and skin contact from the ubiquitous point-of-sale receipts can result in ingestion. In the Fourth National Report on Human Exposure to Environmental Chemicals (Fourth Report), CDC scientists found indications of widespread exposure to BPA in the U.S. population – everyone over the age of 6 potentially. Despite thousands of studies on BPA and its risks, it remains a commonly found chemical in everyday products. In 2009, under considerable pressure from consumers, manufactures started moving away from BPA and marketing their products as “BPA-Free”. However, the FDA still allows BPA in canned goods and consumer-driven BPA-Free campaigns have not had an affect on the FDAs regulation on canned goods to date. Marketing BPA-Free products has proven to be a point of difference, and product design and suppliers have been on the hunt to build products without BPA for some time now. Leading retailers are starting to connect the loop with preferred supplier programs or environmental purchasing guidelines that outline chemicals of concern and require disclosure. Programs like Declare and the Living Building Challenge have put BPA on their Red Lists, signaling that it is not welcome in products meeting these standards. Walmart, Target and other retailers are continuing to expand disclosure requirements for chemicals like BPA and are increasingly banning chemicals ahead of regulatory actions. It’s clear that BPA is everywhere, in virtually everybody, such that making and selling products containing BPA is a risky proposition. When you add brand identity, corporate sustainability goals, and preferred supplier programs from highly desirable retailers, you create an opportunity for anyone wanting to get rid of BPA. You also create an implementation challenge. So how does one actually tackle chemical management for BPA? BPA is primary used in the wide world of polycarbonate plastics, which show up to consumers in the form of beverage containers, compact disks, plastic dinnerware, impact-resistant safety equipment, automobile parts, and toys. BPA epoxy resins are used in the protective linings of food cans and in dental sealants. These products are manufactured by thousands of companies, whose product design and supply chain teams are all dealing with the pressures of price, quality, market share and risk. Sure, it sounds easy, eliminate the dangerous chemical and slap a BPA-Free label on it. But product designers, quality control experts and food standards don’t always make this a feasible strategy. There usually needs to be a substitute chemical, and ideally one that is not as dangerous as BPA. The hazard data behind these chemicals is not very widely available and can be tough to suss out for a single material, let alone a suite of alternatives. Everyone wants to make safer products, but it’s very easy (and common) to make “regrettable substitutions.” In lots of cases companies select chemicals with similar functional properties to those they want to phase out, like BPS or PVC. This makes sense at first glance. You want similar chemical attributes and full-scale product reformulation is expensive. However, this impulse comes with the significant drawback of selecting “cousin” chemicals with far less known about their risks. We have studied BPA far more than we have BPS, PVC, and their many related chemicals. So we don’t know quite as much, but what we do know is daunting. These common alternatives come with as much risk as BPA and for some less common alternatives, we have very little data at all. Where there is an information gap or a perceived information gap, there is a risk. There’s a chance that these lesser studied chemicals come with their own hazards, that are the same or even worse than the ones they are replacing. The science may seem slow to some, but the simple fact that a knowledge gap can spell doom to a product should raise a red flag, from a market standpoint as well as a public health perspective. As the market demands safer products from a brand and regulatory standpoint, investing in unknown or risky chemicals simply doesn’t make sense. 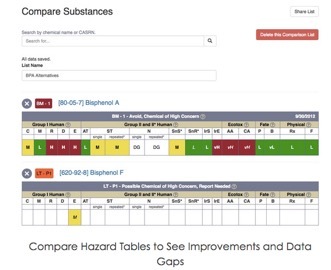 The ability to 1) access chemical hazard data, and 2) see and compare the hazards between several chemicals, and finally 3) redesign products proactively is powerful. Until now, unlocking this information and acting on it has proven tough. It is usually expensive and time consuming to hire and utilize consultants who have access to these data and reports. Similarly the organizational knowledge and ability to liaise with product design, supply chain, legal, and marketing is relatively specialized. It is a learning curve for all these functions. One must be teacher, scientist, organizational psychologist, and product engineer (and lets face it, artist) to weave the nuances of chemical hazard data and product innovation together to craft a successful business paradigm. Those that do this well are truly on the forefront of capitalizing on transparency and sustainability. What does chemical hazard management look like in practice? It has been a disaggregated and rapidly evolving field at the intersection of many avenues in business, ripe for innovation. Enter software. And sustainability. And the forward- thinking minds behind big data, chemical hazard data, and conscious business models. Perhaps an unlikely assemblage of characters, chemical hazard management is ideal for nimble firms looking to solve the complexities inherent in today’s supply chains through software as a solution. One emerging frontrunner in this field is Sustainable Brands Innovation Open 2017 finalist toxnot, an ambitious startup raising the bar on transparency in chemical hazard management. Already recognized by Walmart and other major brands, toxnot is shaking up the field by attacking all pain points of everyone working on chemical hazard management. Its cloud-based services are disruptively affordable compared to the thousands of dollars spent on individual chemical hazard reports, product declarations and the like, and it boasts seamless integration with virtually any internal software that typically houses chemical and supplier data. What has historically been a huge cost for companies can now be simplified and streamlines elegantly. Features like instant uploads, supplier surveys, automated reporting outputs for virtually every reporting scheme, and privacy options that are absolute necessities today are built in, a first for software of this kind. Perhaps most importantly, toxnot also simplifies the challenge of finding and assessing risks in alternative chemicals — a quick search for a baseline substance reveals risks and simple addition of alternative chemicals quickly builds a dashboard that allows teams to instantly make comparisons. This example shows BPA and one of its alternatives. Here one can compare BPA vs. BPF. Color-coded risk categories pop up and data gaps are clear. A risk-adverse product designer could use this instantly, and according to this example, should be cautious in using BPF as an alternative. There is too little data to ensure it is safe. Join us at New Metrics ’17 for more on this and other new developments and players in the area of chemical transparency and footprinting. Leading experts will share not only the evolution of this critically important aspect of product design, but also emerging leading assessments, tools and management practices – including toxnot, the Chemical Footprint Project, and more. Welcome to the SB Community! In the future, you will receive periodic news and updates about New Metrics '17. Thank you! Your New Metrics '17 discount code will be delivered to your inbox momentarily.